I doubt that Connolly ever had the idea that he would do an entire book dedicated to Louis and Angel. That being said, I had hoped early on that this book would eventually exist. 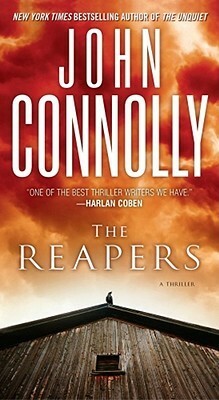 In The Reapers, long time associates of Charlie Parker, Louis and Angel, get their own novel. Louis and Angel have recently fallen into the cross hairs of a rival long thought dead. A former colleague of Louis, Bliss, has returned to seek his vengeance against those who brutally disfigured him, leaving him for dead years ago. However, Louis and Angel are unaware of his resurgence, accepting a job from a wealthy criminal recluse who asks them to take out his longtime rival. The pair goes missing during said job and it’s up to their friends, led by Parker to find them. This novel is refreshing in so many ways from the previous Parker installments. Gone is the first person narrative, gone are the supernatural aspects and for the most part, gone is Charlie Parker himself. Having already explored a lot of Angel’s history in the earlier books, Connolly dives deep into Louis’ upbringing and the circumstances that led him down his path in life. Told through flashbacks, Connolly shapes Louis through his first kill and his subsequent recruitment of a man known as Gabriel. This man becomes Louis’ father figure, molding him into a “Reaper”; a hit man. I really enjoyed the back story on Louis, I felt like it’s long overdue and without a doubt, he’s grown to become my favorite character in the Parker series. He’s written with such passion; Connolly paints him as a consistent professional but with a dry sense of humor that is just awesome. The novel also goes into detail the lengths that Louis and Angel take to maintain their lifestyle. Louis does a lot of his business through shell companies and pre-paid, disposable cell phones, trying not to deal with anyone directly unless absolutely necessary, even paying homeless people to pay bills and acquire new phones with pre-paid calling cards. It’s pretty slick. Parker’s role was perfect, leading a rag tag group of allies to aid Louis and Angel upon their disappearance. I’m growing to love Parker’s hired goons, the Fulci brothers. Their associate, Jackie Garner (hired by the Fulci brothers to take care of their business affairs), had one of the better moments in the series leaving me laughing out loud. I’m so glad Connolly decided to give Louis and Angel their own entry in the long running Parker series. I’m hoping that he one day decides to give them another kick at the can. I’ll try not to be greedy though – I’ll take as many Parker books that Connolly will throw at me.